Because water utilities are dependent on the sale of water to recoup costs, reduced sales can result in deficits – and per capita water demand in California has been stagnant or decreasing for the past several decades. Over the coming years, California municipal water utilities are required to reduce water use by 20%. Thus, the “new normal” or an era of declining demand and rising costs is a trend that is likely to continue. Water utilities can learn from a number of electricity pricing practices to help adapt to this “new normal” while staying fiscally solvent and providing fair prices. In order to understand how some of these practices might be relevant to the water sector, the Pacific Institute examined a range of electricity pricing practices and policies that California electric utilities use to remain financially stable even when per capita demand is decreasing. 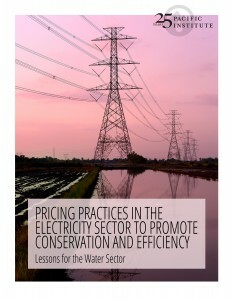 The paper, Pricing Practices in the Electricity Sector to Promote Conservation and Efficiency: Lessons for the Water Sector, helps inform discussion at the local, regional, and state level about water pricing in light of recent and future reductions in water demand. Although rate-setting processes for electric utilities and water utilities differ, the study finds that a number of promising electricity pricing practices could be implemented, or further implemented, in the water sector. Some of these practices are already common in the water sector (e.g., tiered rates), while some are becoming more widespread (e.g., seasonal rates, rate stabilization funds). Others have not been widely applied to water (e.g., demand response contracts and the calculation of an inherent commodity cost for water in the utility’s revenue requirement). In the case of marginal cost pricing, there is little known about the extent of adoption in the water sector as there is no single, standard approach to marginal cost pricing or reporting requirement. In partnership with the Alliance for Water Stewardship and the California-Nevada section of the America Water Works Association, the Pacific Institute held two Workshops on Water Rates and Finances in Northern and Southern California in 2012, with nearly 100 water utility staff, board members, and other interested parties. The workshops covered a range of finance-related issues including capital finance basics, water demand forecasting tools, innovative water rate structures, affordability programs, and a public goods charge for water.